Last year, I posted my breakout players as “players to watch.” I missed on some (CJ Walker), others such as Temple Gibbs, I was correct. This year, I have identified eight players I think are going to emerge as those who could be household names by the conclusion of the 2018-19 season. The numbers that they reside next to identify my confidence in the prediction coming to fruition. 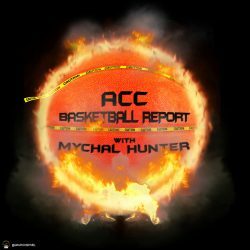 If you have been listening to the ACC Basketball Report podcast or heard me on the College Hoop News podcast you know some of these names. Others may be a bit surprising. Now, there are some guys who you will not see on this list. For instance, Chris Lykes of Miami. That is not because I am not a fan (oh I am) I just think he isn’t really a break out player. Everyone knows that kid is talented and expects him to be a key cog for Miami this year. Got it? Ok. Anyone who has listened to any of my recent pods or appearances knows, I am a huge believer in this kid. Size, shooting ability, rebounding are all talents he possesses and now he will have his opportunity. Nwora’s game and skill set is superior to VJ King in my eyes and with the way new coach Chris Mack likes to use his wings, the opportunities will be plentiful. Walker is probably the most naturally talented player on this list. A former five star prospect in the 2017 class. Expect that percentage from deep to rise around 5 points and the average to nearly double. Walker should become a featured part of the offense this season, receiving the bulk of the minutes at the two guard spot. I like him there so he can concentrate on his scoring, which is his natural way of playing. I am not sure he will ever be a big time contributor in the other categories, but he will eventually be a huge scorer for the Seminoles. Is this one a cop out? Maybe. Do I care? Obviously not. If Wake Forest has any chance to break into the top 10, Childress has to be dynamite. I think they have the talent to do that, but are lacking in some other key areas. Childress however, will be the upper classman that this talented group of freshmen turn to for on court leadership. He does a little bit of everything, he has the pedigree and he has his old man, a Deac’s legend, on the bench to motivate him. I think he could put up Bryant Crawford type numbers this season, but with maybe more efficiency. Let me try to not be biased. Ok. Curt is a player who would have made a name for himself last season had it not been for a tough luck injury. Now, seemingly fully recovered, CurtGoneBad (i love that twitter handle) is about to receive as much as he can handle as far as opportunity goes. Apart from freshman Mike Devoe, Haywood will be the Yellow Jacket’s primary threat from outside. Word out of Atlanta is Pastner wants to run more and shoot more triples this season. Talent and opportunity people, when those two things meet, good things tend to happen. I have said many times in the past year, if you are going to teach someone shooting form watch CH2 shoot the ball. Factor in that he owns a 2:1 A/TO ratio and rebounds fairly well, you could argue that he could be the Jacket’s best player this season. In order for Clemson to get back to the dance, Simms is going to have to provide quality production. At 6’7 240 he has the size and athleticism to play the hybrid forward type position. He should slot in to the spot vacated by Donte Grantham, which he also did last season. In order for Aamir to be a productive member of this Tiger’s rotation he needs to put up better percentages. He doesn’t have to put up Grantham numbers, but he has to be efficient. 45% (conference play) from the FT line isn’t going to get it done. He has talent around him so he shouldn’t feel a ton of pressure. There is also the trend of the biggest progression happening between years 1 and 2. He should be fine. Normally O’Connell would be way up on this list. Unfortunately for him, he may only have the talent part of the talent + opportunity equation. He is going to play, although he is currently injured, but he will more than likely be a role player type. Alex is the type of player that would have starred on old world Coach K teams. A Chris Carrawell, Shane Battier type player. I think he really blows up as a junior as the Duke recruiting class probably won’t be as vaunted next season. He can really stroke it and has crazy athleticism. Yes. CRAZY athleticism. Stevenson is a player I talked about a lot last season. I like his game, I like his versatility. The reason he is so low on this list is I don’t know how high of a ceiling he has. 9 and 5 is great for a freshman, but I don’t know if we’ll see a huge jump in those numbers. He was actually pretty efficient last year as well. Until we see how Capel is going to play this time around in his coaching career it is hard to project. Stevenson will also be playing with a freshman back court and co-wing player in Jared Wilson Frame that likes to chuck it up. It’s possible, but I am not sure. Diakite is the most likely recipient of the minutes ACC DPOY Isaiah Wilkins left behind. At 6’9 he has the height, but at only about 200 pounds he is still a bit thin. He is certainly athletic enough to be an above average help side defender as the pack line defense funnels players to the middle of the bucket. One thing that does concern me is that he averaged more minutes per game as a sophomore, but his blocks per game regressed from 1.2 as a freshman to 0.5 last season. Diakite will never be a good scorer, but neither was Wilkins. The style that Coach Bennett likes to play doesn’t really require him to be anyway. Kyle Guy, Ty Jerome and De’Andre Hunter will take care of that anyways. If Mamadi can protect the rim, hit the glass and make his free throws that will be perfect. He won’t put up huge numbers, but he will be a key piece on a very good team.